Who is Lorelay Bove ? Lorelay Bove was born in Spain, and moved to the US during her childhood. She went to Laguna College of Art and Design, then to CalArts. 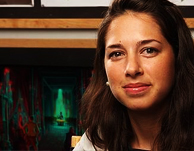 Lorelay started as an art intern at Pixar, then became a visual development artist at Walt Disney Animation Studios. She had an influential role in the visual direction and development of The Princess and the Frog. Lorelay painted a postcard named : greeting from Los Angeles, on which a young girl, at the beach, is reading the Sketchtravel book.